He arrived in an enormous black Hummer limo which looked a tad out of place in the Bull & Bear parking lot. The idea to do a tour and signing was obviously very last minute as they didn't have any copies of his new book to purchase and the staff at the pub only found out he was coming that morning. Although he arrived 40 minutes late, he still spent some time talking with various customers (a lot of whom are Irish) and then autographed various Guinness paraphernalia that people had brought in. I managed to talk with him briefly and get a Guinness 250 poster signed and invited him to drop by the brewery if he ever found himself in Austin. They had a few autographed copies of his book to give away so Tommy (owner of the Bull & Bear) had a free drawing to distribute them. 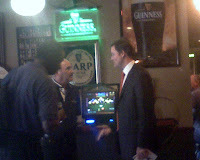 Unfortunately, I did not win, but at least I got a few free pints of Guinness.